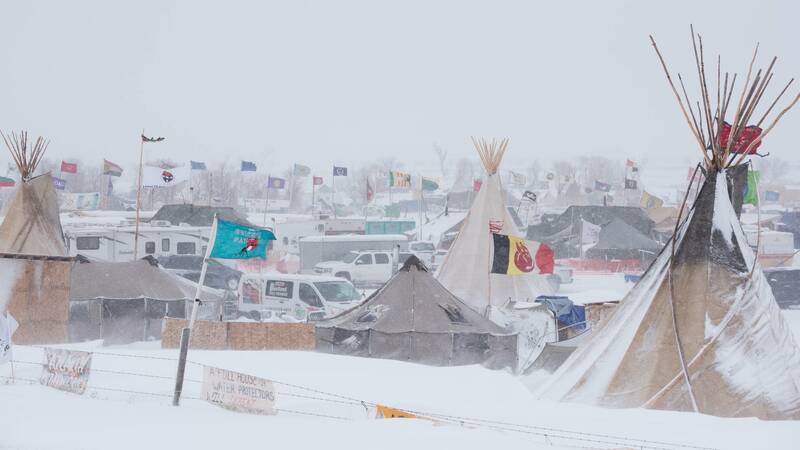 Thousands of people protesting the Dakota Access Pipeline project are promising to remain in their encampment about 50 miles south of Bismarck, N.D. That's despite snow, strong winds and evacuation orders from state and federal officials. Opponents of the project have halted construction of the nearly complete 1,170 mile pipeline for the time being as they camp at the confluence of the Cannonball and Missouri Rivers. They say a break in the pipeline under the Missouri River could send volatile Bakken crude oil gushing into the river, fouling the water supply for the Standing Rock Sioux Reservation just downstream. A study by the U.S. Army Corps of Engineers found spills would likely be too small to be toxic, and that the company, Energy Transfer Partners, plans to monitor water quality. 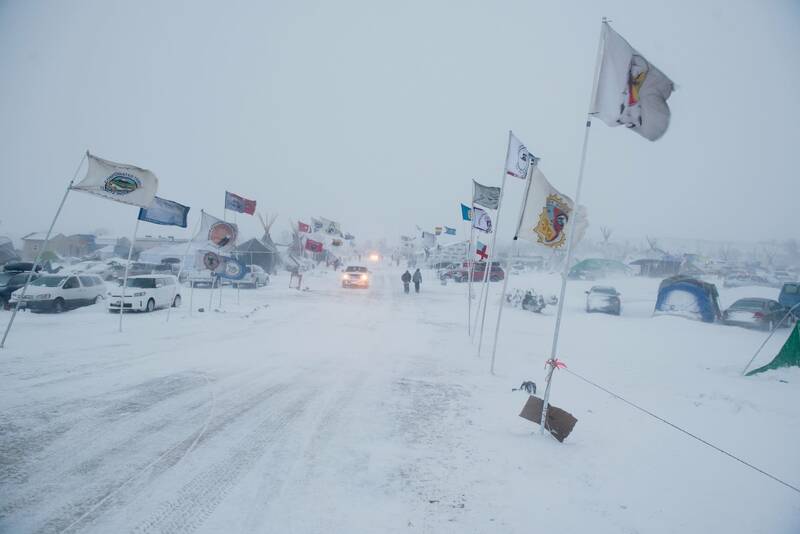 Even with a winter storm warning in effect through Wednesday, protesters are still arriving at the sprawling camp called Oceti Sakowin. Inside a large canvas geodesic dome that serves as a meeting area and overnight shelter, Melaine Stoneman, a camp medic, gave a dozen and a half new arrivals an orientation on etiquette and safety. She admonished the group — all women — to be careful, especially during any confrontations with law enforcement. "You have to protect yourself whether you're here or you're out there. It's very, very important for you," she told them. A member of the Sicangu Lakota tribe from Rosebud, S.D., Stoneman said she's been here since late July with her family. The blast of winter weather is not a hardship for them. "It's beautiful to be able to come back and live how we used to live," Stoneman said. "This is nothing new to us. Some of us live like this every day. 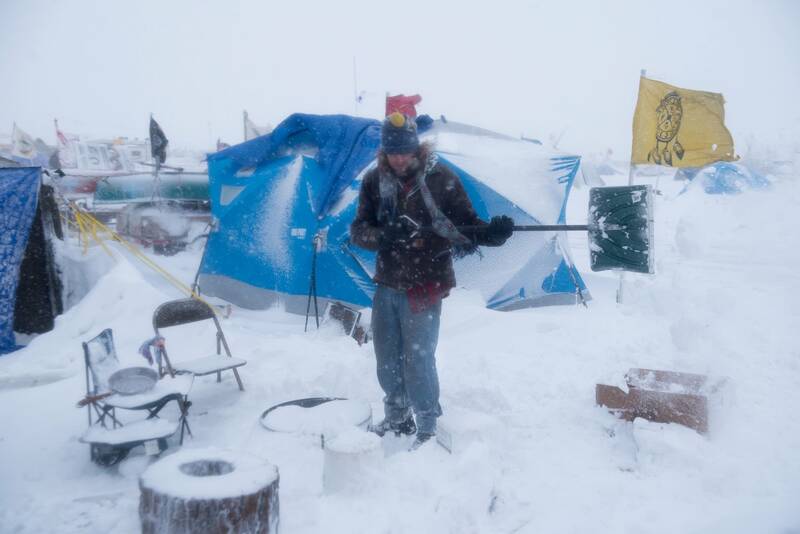 A lot of our people on our reservations live like this also." At another spot known as the sacred fire, people gathered throughout the day for songs, prayers and general camp announcements. As the blizzard whipped up, a man and woman fought 30 mph wind gusts and horizontal snowfall while hurrying to finish building a small shelter made of two-by-fours and plywood. Marcus Frejo, a Pawnee musician from Oklahoma who performs as Quese IMC, said the weather is only strengthening their resolve. The effort to stop the pipeline is just the latest chapter in a centuries-long struggle for native peoples' rights, he added. "This black snake, this Dakota Access Pipeline, is just a descendant of that same old destructive force that has long tried to break us, destroy our resources, our land and our people." On Monday, North Dakota Gov. Jack Dalrymple ordered a "mandatory evacuation" of the camp because of severe weather. That followed an announcement on Friday by the Army Corps that it would close access to the camp on federal land by next Monday and set up a so-called "free speech zone" on the south bank of the Cannonball River. But at the same time, the Corps says it has no plans for forcible removal of people from the camp. And the governor's office says there is no truth to rumors that local authorities plan to block supplies of food and building materials. In a statement, a Morton County Sheriff's Office spokesperson called Dalrymple's order a "public safety message to ensure that no lives are endangered." 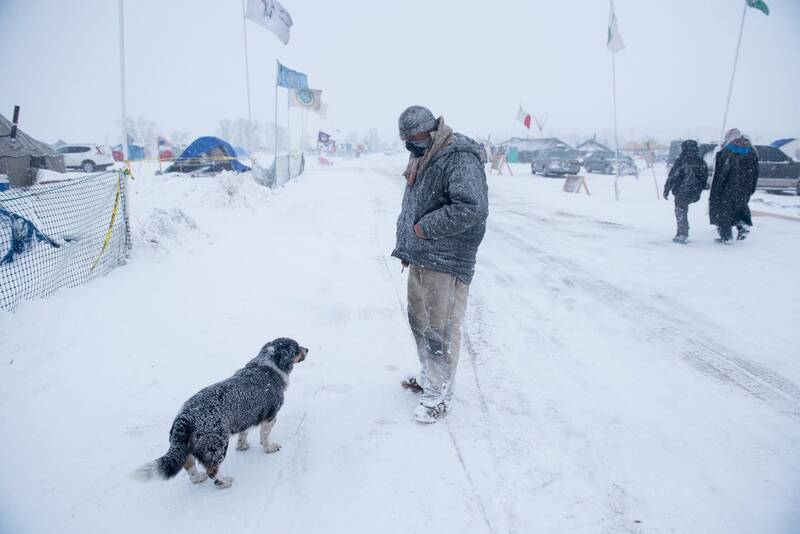 But she added that law enforcement is patrolling roads around the camp and may stop people hauling lumber to inform them that they are subject to a $1,000 fine. Even in the face of those warnings, as many as 2,000 military veterans plan to come to the camp next week in support of those already here.